Ballingham Court, which farms 200 ewes, 70 stabiliser cross-cows and 40 Herefords (plus apples, pears, cereals and maize), needed to replace a troublesome pump that was unable to handle the 11% dry matter thickness of the digestate being discharged from the digester. This caused disruption to the farm's 80kW biogas plant, which exports most of its green energy to the National Grid. "Everything has been fine with the discharge since the Borger pump was installed", said Esther Rudge, who alongside her husband, Henry, owns and runs Ballingham Court - with son Monty now principally managing the AD plant since joining the business after studying agriculture at Harper Adams University. "Borger quickly helped us out with a temporary solution until a larger unit could be installed. We were already very pleased with their Powerfeed system and Multichopper macerator at the front-end of our process, so it was perhaps no surprise that their additional pump was also of very good quality". On the 320-acre farm, Borger@s Powerfeed mixes and homogenises the feedstock of fruit, manure, maize and chicken litter regardless of the content's variability. The raw material feeding technology guarantees safe and reliable processing of solids from 4-5 tonnes per hour, up to nine tonnes per hour, if required. "The Borger Powerfeed has always worked well" added Esther Rudge. "Despite the inevitable foreign objects (such as wood) that get caught up in straw, the Powerfeed will handle it - and at the next stage of the process, the Borger macerator (the Multichopper) will sort it out properly". Beyond the Powerfeed and connected by a Borger circulation pump, the P500 Multichopper benefits from a tough, perforated disk chopper with an equally robust central high-performance rotating blade holder, benefitting from reversible blades. The Multichopper's multiple blade cutters are automatically adjusted by the Borger MCA (Mechanical Cutting Adjuster). Throughput volumes are up to 400m3/h (1760 usgpm). At Ballingham Court, Borger has also supplied a bespoke control system to give a fully automated feed-in system. A PL200 Borger pump provides continuous feed for a 10m3 buffer tank. As the tank approaches it capacity, the system typically performs a 5-minute feed cycle, pumping the feedstock from the Powerfeed through Multichopper macerator and into the digester. The time-length for a feed-cycle can be adjusted for certain feedstocks in order to maintain gas levels. This system prevents any fluctuations in temperature that would prevent the AD process from operating at optimum levels. Load and flow sensors also enable Borger to monitor the equipment remotely so that they can see at a glance via a smartphone or pc that the feed/not-feed set-up is working as it should be. Operating at around 1Bar, with no great head of pressure to overcome, it is a gentle, carefully managed system. 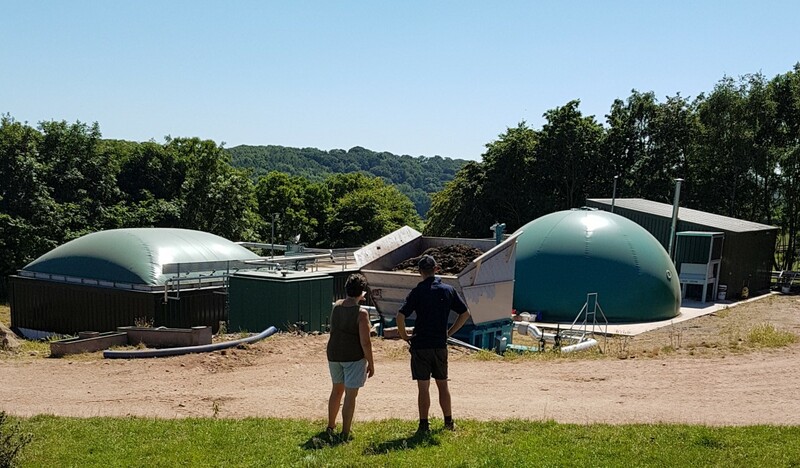 With the new Borger pump now taking good care of the digester's discharge at Ballingham Court, Esther Rudge believes that she and her husband Henry's farm is now firmly on course to hand over to the fifth generation in the future with a true legacy. "We're coming up to two years since our AD plant was commissioned", she said. "Our investment in AD will no doubt continue to be a learning, fine-tuning part of our farm life, but we've achieved our aim of becoming increasingly sustainable and generating a new income stream. There's the bonus too of producing very good fertiliser". She added: "We're almost landlocked here by the River Wye (halfway between Ross-on-Wye and Hereford), with poor road links and ever tightening restrictions on what we can and can't do, so it was vital to our future that we became as sustainable and self-sufficient as possible. "NVZ regulations (Nitrate Vulnerable Zone) were taking more effect and we considered building a pad to store manure but then in simple terms thought why not enclose it, put a roof on it and gather all the methane for good use. Our son Monty's enthusiasm for our AD plant was infectious, and he's determined to make it work to its full potential." "Going into AD has already been quite a journey, but the confidence we have in Borger's equipment and their approach as a company has made everything much simpler. In addition to the energy we generate, the liquor we tanker on to our land is very rich in nutrients and good for our soil, as is the digestate." "Even though our AD plant isn't on a large scale, we've seen first-hand that standard equipment simply cannot cope with certain feedstocks or the inevitable variations in what goes in to a digester. Tough, industrial-type equipment such as Borger's is therefore a must".